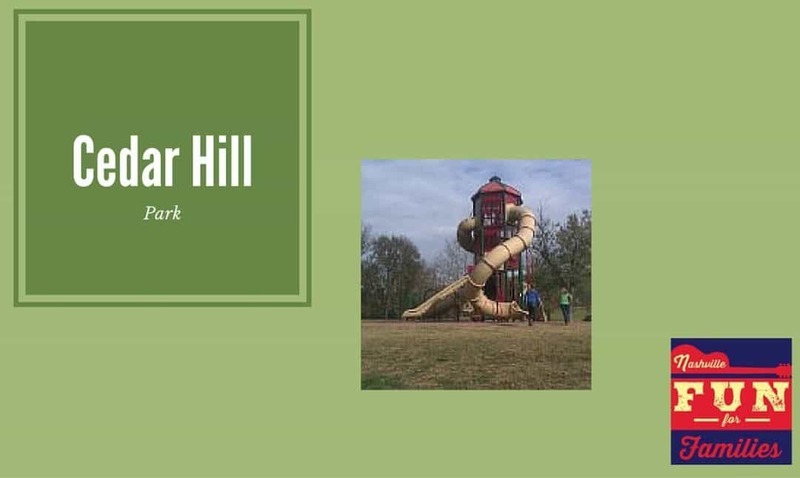 Cedar Hill Park is located in North Nashville on Old Hickory Boulevard. 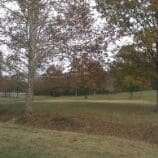 This park features an unusually large playscape, seven reservable picnic shelters, sports fields, trails, a duck pond and lots of open greenspace. As you drive in the entrance, you can drive straight to access the sports fields and picnic areas. If you are only interested in the playscape, hang a left just after you drive in and it will save you lots of time. This play area is NOT for toddlers. It is gargantuan. 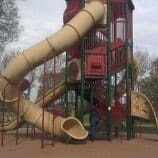 It features two high twisty slides and a few straight slides. 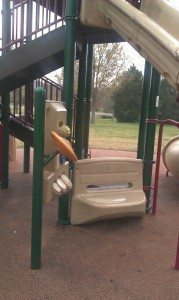 There are several spots within the play area that are designed to appeal to younger kids. But, personally, I think the lure to climb this structure and go down the big slides would be too much temptation for a very small child. 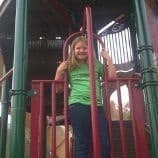 I took Ava (9), Katie (11) and Anna (13) and they really enjoyed it. Most play areas are too small for them so this was a nice change of pace. 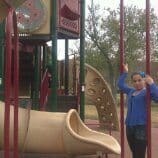 In addition to the large playscape, there is also a set of swings located in the same area. If you continue driving straight as you enter the park, you will pass the sports fields on your left. After you pass those, you will drive by the beautiful pond. One of the unique aspects of this park is the picnic shelters. Each one has it’s own private area. They all have their own parking which would be convenient for family reunions or birthday parties. Some of them feature small play areas and/or views of the pond. Each of the seven shelters is distinctive so I would definitely make a trip to check each of them out before reserving one for an event. 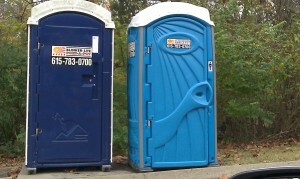 Unfortunately, port-a-potties are the only bathroom facilities available at Cedar Hill Park. And trust me, you don’t want to go in one. Plan your trip or event accordingly. A great place to picnic.